Last weekend was filled with Memorial Day BBQ’s, rooftop parties, and festivals. There’s no holiday to commemorate this coming weekend (which as far as I’m concerned, starts today) but it doesn’t make it any less event filled. 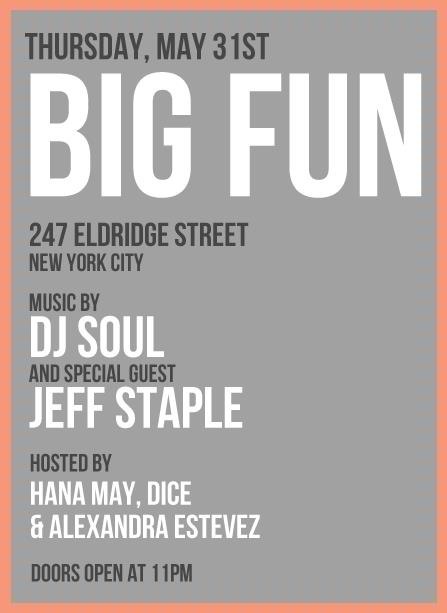 And so, it starts tonight with the BIG FUN party at The Eldridge and Jeff Staple is guest dj’ing. 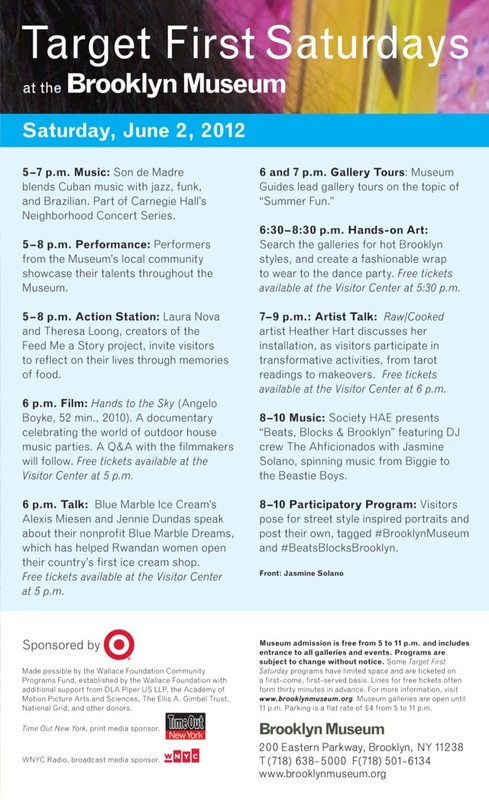 This Saturday is the first of the month so that means all of Brooklyn and the hippest of the outter boroughs will be packed in the parking lot of the Brooklyn Museum on Eastern Parkway listening to Jasmine Solano DJ. For more on First Saturdays, click here. Lower Manhattan will be providiing more than enough shopping, food, and entertainment since Saint Anthony’s Feast is also happening on Mulberry Street from Spring Street to Broome Street. I haven’t ever been to San Gennaro but I imagine what’s going on is close. I walked through yesterday and there were carnival style games, jewelry vendors and more than enough italian sausages and deep fried oreos. 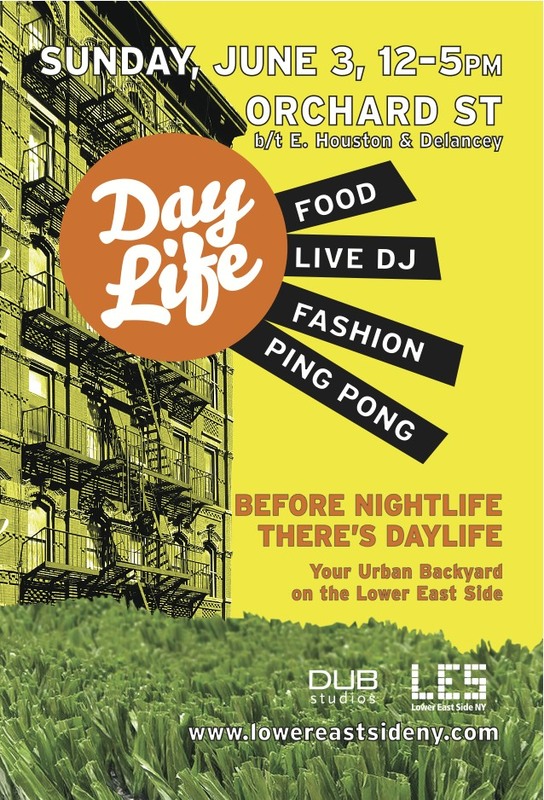 “DayLife” is an event that hopefully will be the first in a series of original Sunday programming on three blocks that have been closed to vehicular traffic since 1972. Paying homage to the history of the neighborhood, DUB Studios has created a modern pushcart designed specifically for LES businesses to sell merchandise right on the street. The event will have a backyard BBQ feel with Astroturf serving as grass, picnic tables to hang out at, ping pong tables, a skateboarding ramp, music and more. A few of the participating food vendors include Brooklyn Taco, Goodfellas (which has some pretty good zeppolis, and The Meatball Shop. For more on Day Life, click here. This entry was posted on Thursday, May 31st, 2012 at 12:09 pm	and is filed under EVENTS. You can follow any responses to this entry through the RSS 2.0 feed. Both comments and pings are currently closed.